From the United Kingdom’s privatisation of the management of its entire immigration detention estate to Germany’s decision to keep all detention facilities in official hands and France’s employment of private non-profit groups in its centres de retention administrative, Europe reflects the gamut of policy responses to the growth of the immigration control industry. 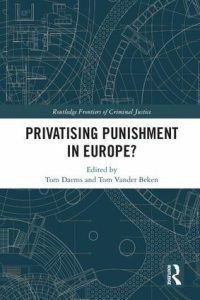 In this chapter for the 2018 Routledge volume Privatising Punishment in Europe?, edited by Tom Daems and Tom Vander Baken, the GDP’s Executive Director Michael Flynn, Contributing Researcher Matthew B. Flynn, and Eryn Wagnon detail the variety of levels and forms of privatisation adopted by several EU Member States in this area of immigration policy, as well as the challenges that the outsourcing of immigration controls posits. More information about Privatising Punishment in Europe? is available here.